The long-term economic success of a nation depends to a great extent on sustained increases in its endowment of human capital — the accumulated knowledge, skills and capacities of its workforce. This chapter focuses on the crucial role that investments in human capital, specifically in the education and training of the population, will play in maintaining the Philippine's development momentum. The important role of education in development is well known. Nobel laureate Amartya Sen (2011) argued that “the elimination of ignorance, of illiteracy … and of needless inequalities in opportunities [is] to be seen as objectives that are valued for their own sake. They expand our freedom to lead the lives we have reason to value, and these elementary capabilities are of importance on their own” (p. 240). Indeed, limited access to education, particularly of poor households, consistently emerged as a major concern in the recent focused group discussions conducted for Filipino 2040 (see David 2015). Education is not only an end in itself; it is also a means to enhance well-being by increasing an individual's productivity and therefore earnings. Incontrovertible evidence suggests that people with greater education and training have better employment opportunities and higher earnings. Access to education can help lift poor households out of poverty by breaking the intergenerational cycle of poverty (HDN 2000). Poverty is perpetuated mainly because poorly educated parents, mired in low-paying occupations, lack the means to continue to send their children to school, effectively condemning them to low-productivity employment and, consequently, meagre earnings. To households earning subsistence incomes, the opportunity cost of sending their children to school — hence foregoing income from their children's labour — is too high. Studies have shown that dropout rates are higher in poor households where parents have low education. The obvious way out of this poverty trap is for children to acquire an education that allows them entry into higher paying jobs. This can happen if private entities or the government subsidize the cost of education of the children of poor households. The benefits of education extend well beyond the well-being of those who receive it. Society also gains from the positive externalities of an educated citizenry. People with more education are more likely to be more civic-minded, better able to understand social and political issues, vote more wisely, obey the law, and adhere to the basic rules of good manners and conduct. It gives me great pleasure and honour to provide the introductory message for this rather impressive volume on the Philippine economy. Authored by renowned Filipino scholars and serious observers of the Philippine economy, the volume is arguably the most comprehensive reference work on the economy since at least the global financial crisis in 2008–9 and will likely shape the thinking and practice of Philippine development policy in the years ahead. It was an exciting prospect for Asia, except for the Philippines. In the Report, the Philippines was a slow- or modest-growth aspiring country, lumped in the same group as Afghanistan, Bangladesh, North Korea, Laos, Myanmar, Nepal, Pakistan, and many of the Pacific Island countries. Even the Report's epic video-production did not make any reference to or show any significant Philippine landmark. That was, of course, understandable, given the country's poor-growth record in the three decades before 2010, which was the report's database for its extrapolation of the future. In contrast, since at least 2010, the country's economic performance has been quite stellar, impressively even earning the title 'the rising tiger of Asia', among other accolades bestowed upon the Philippine economy by various global development observers, e.g., the World Bank and HSBC. No one wants to be sick. Yet, those who fall ill are punished with the high cost of accessing healthcare. While one cannot totally prevent it, conditions where an individual is born, grows, works, lives and ages contribute to the likelihood of falling ill. For example, population groups residing near development projects are unnecessarily exposed to hazards, thus increasing their vulnerability. Residents of disasterprone areas cannot rely on their health system in the aftermath of a shock, even after a few years, for them to live the way they used to. This chapter argues why the government should sustain its ongoing investments in health, and proposes where and how these investments should be channelled in order to ensure that (1) the system is designed as one which promotes health or makes it easy for people to choose the healthier option; (2) those who fall sick are not driven to impoverishment; and (3) the system remains dependable in the event of shocks/disasters. Box 5.1. A Typical Case of a Filipino Family in 2016 Jose and Alicia, are minimum wage earners. They live in Cavite but work in a factory in Mandaluyong City, Metro Manila. Commuting to work means losing four hours daily to travel. Because they are home late and have to leave early the next day, they are unable to prepare lunch. They are suki (frequent patrons) to Aling Nene's ration consisting of one-fourth serving of viand and three-fourth serving of rice — food with little nutritional value and that is often salty. At work they are exposed to high heat, with the factory having little ventilation. One day Jose had a bad case of diarrhoea requiring admission. They chose to go to the nearest government hospital. Since Jose, a PhilHealth insurance member, was confined in the “charity ward”, where one nurse takes care of eighteen patients simultaneously, Alicia had to stay as a watcher to make sure all of Jose's needs were being met. Moreover, the attending physician tasked Alicia to purchase medicines in a drug outlet a few kilometres away, as the hospital pharmacy had run out of stock. After three days in the hospital, both Jose and Alicia had lost three days of work and had spent most of their savings. Jose will also need to start allocating a portion of his salary for maintenance medications. This chapter deals with promoting the common good through better energy, resource and environmental policies as well as improved management of natural disaster risks, including climate change. Increasing gross domestic product (GDP) will be insufficient to meet the aspirations of the Philippine people for higher levels of living, inasmuch as GDP does not measure welfare. Largely because of the omission of these elements, we begin with a discussion of green accounting — the method of extending national income accounting to include the degradation of the environment and the depletion of natural resources. As we discuss in the second part, comprehensive national income accounting can be further extended to include natural disasters and other shocks to the ecological–economic system. Even policy distortions can be accounted for by including them as constraints to the system. Thus, environmental resource conservation, disaster preparedness and policy reform all become potential sources of welfare growth. The later section deals with the mission of sustainable development, particularly how the Sustainable Development Goals (SDGs) relate to the mission of improving the welfare of Filipinos. Stewardship of natural resources and the environment should not be treated as a separate objective from management of the economy (World Commission on Environment and Development 1987). The fundamental premise of sustainable income and green accounting, which have a long history in the Philippines and other countries, is that nature and the economy are part of the same system (the environomy) as shown in Figure 6.1. And one system requires one unifying measure of performance. To convert the most common indicator of the size of an economy, GDP, into a measure of national well-being, several adjustments must be made. It is well known that GDP overestimates public welfare by failing to deduct depreciation — that portion of investment that simply replaces capital which has worn out or become obsolete. Deducting capital depreciation from GDP yields net domestic product (NDP). And since income is a better measure of welfare than production, we need to subtract the income earned in the Philippines by foreigners, add income earned by Philippine citizens abroad, and add remittances to the Philippines by non-citizens. By Gilberto M. Llanto, Philippine Institute for Development Studies. Substantial resources for financing critical development expenditures will be needed to sustain the current economic momentum and meet future socio-economic aspirations. Where should the country get its financial resources to implement priority measures? This chapter looks at three main sources of funds — households and firms, donors, and foreign investors — and examines long-term implications with reference to taxation, the overall financial system, public–private partnerships (PPP), official development assistance (ODA), and remittances. It is imperative for the government to substantially raise tax revenues and rely more on domestic borrowing. ODA and PPP should be used to strategically finance infrastructure needs and emerging regional public goods, respectively. Financial reforms should be geared towards providing access to poor households and micro, small and medium enterprises, as well as financial education for overseas Filipinos and their families, to widen their investment horizons. Related financial inclusion policies and interventions are an important component for achieving the country's long-term vision. Figure 8.1 provides a convenient framework highlighting the task of raising and channelling funds from the three main sources identified above to be used in policy-determined development expenditures. The new development finance institutions such as the Asian Infrastructure Investment Bank (AIIB) are specifically included in the figure to indicate their potential as another major source of infrastructure finance for the Philippines. In the case of the AIIB, the People's Republic of China (PRC) is positioning itself as the largest international source of loans for infrastructure. The bilateral Philippine–PRC relationship will have a major bearing on how the country can access this source of long-term loans. Households and firms pay taxes to the government, while the process of financial intermediation transforms the savings of households and firms into an adequate supply of finance for the use of the private and public sectors. Donors provide the government with loans, grants and technical assistance (TA), while foreign and domestic investors participate in PPP by taking an equity position, providing debt finance and engaging in the operation and maintenance (OM) of infrastructure facilities such as rail, ports, toll roads and airports. Private domestic and foreign investors also tap the financial and capital markets for resources to invest in PPPs for infrastructure. Public sector loans, grants, PPP schemes, and TA provided by donors to the government are utilized to finance critical development expenditures. The Philippine economy grew by 6.8 per cent in 2016, which is high by regional standards. The strong performance departs from its average growth of only 4.2 per cent since the 1960s. However, a quarter of the population remains poor, repeating its record in 2000, when it had as many poor despite a rate of growth of 6 per cent. Unlike its East Asian neighbours, the country has been weak in translating growth to lowering poverty (Balisacan and Fuwa 2004). This chapter looks at the factors shaping growth and poverty in the Philippines. Studies have attributed significant gains in poverty eradication in East Asia to sustained robust growth (e.g., Dollar and Kraay 2002; World Bank 2006). The next section takes up the factors contributing to growth performance and examines how the current robust growth can be sustained. The third section focuses on the problem of the country's weak capacity of translating growth to poverty reduction. Apparently, high growth with less inequality reduces poverty faster (Bourguignon 2003; Fosu 2010). The chapter then tracks using an economy-wide model of the Philippines the per capita GDP and poverty trajectories of the country into the next twenty-five years under two growth and two income distribution scenarios. The last section states the study's key findings. The Philippine economic growth in recent years has been robust by regional standards (Table 2.1): 6.8 per cent in 2016 and an average rate of 6.3 per cent from 2010 to 2016 (Figure 2.1). The performance departs significantly from its average of 4 per cent from 1961 to 2009. Since 2000 the average growth increased to 5.21 per cent per year, and could have been faster were it not for the global economic crisis in 2008. Compared with selected East Asian countries (Table 2.1), the growth performance of the Philippines was markedly behind those of its neighbours in the 1980s and 1990s. In the 2000s, however, the country caught up with its Southeast Asian neighbours, and exceeded their growth in the last five years. The growth of the People's Republic of China (PRC), however, has remained the fastest since the 1980s. It is a pleasure to thank the many people and institutions who contributed generously to this volume, and without whom it would not have seen the light of day. First and foremost, we would like to express our deep gratitude to our good friend and colleague, Arsenio M. Balisacan, and his staff, for initiating this project during his term as Secretary of Socioeconomic Planning and Director General of the National Economic and Development Authority (NEDA) in the Government of the Philippines from 2012 to 2016. As he explains in the Foreword written for this volume, he and his senior colleagues in government oversaw a period of strong economic growth. But they were also conscious of the importance of maintaining the momentum. To this end, they set to work on crafting a forward-looking agenda, Ambisyon Natin 2040, which articulated a vision for an inclusive and prosperous Philippines. Some of the works commissioned for this endeavor provided the germ for the analytical papers that fed into this volume. The Asian Development Bank (ADB) played a crucial supporting role in facilitating work on this project, including a workshop at which draft papers were presented and discussed. We are most grateful to the staff of the Bank's Philippine Country Office, headed by Richard Bolt, for their enthusiastic support and wise counsel. While thankful to NEDA and the ADB, we do wish to emphasize that the views and assessments in this volume are those of the contributors and editors alone, and should not be attributed to these two supporting institutions. We are most grateful to our contributors for taking time out from their busy schedules to write stimulating papers, and to cheerfully endure the protracted editorial processes leading up to publication. We thank Mr Ng Kok Kiong, Mr Stephen Logan and the ISEAS publishing team for their interest in our work, and an anonymous referee for very helpful and constructive comments on an earlier draft. The current period is arguably one of the most significant in Philippine history. The country is frequently in the international news headlines, perhaps more than it would like to be. Behind these headlines is the question of whether the momentum of recent economic growth in the country can be sustained and its dividends enjoyed by more of the population. By Ramon L. Clarete, University of the Philippines, Emmanuel F. Esguerra, University of the Philippines, Hal Hill, Australian National University. The Philippines has long been viewed as the “East Asian exception”. Although suffering massive wartime destruction, in the 1950s and 1960s its economic prospects were considered to be favourable. While very poor, its per capita income was somewhat higher than most of its neighbours. In the post-colonial era it neither closed off from the global economy — as China, Indonesia and Myanmar did — nor was it overwhelmed by the conflict that engulfed Indochina. Its civil society and polity appeared to be among the most robust in developing East Asia. And it retained close commercial and political ties with the undisputed global super power of that era, the United States. As a vote of confidence, Manila was selected to be the headquarters of the Asia Pacific's premier development finance institution, the Asian Development Bank, in 1966. However, these early high expectations were not realized. From the late 1960s the Philippines increasingly parted company with its neighbours, as first the four Asian NIEs, then the ASEAN four (i.e., Indonesia, Malaysia, Thailand, together with Singapore) and, most important of all, China began to register exceptionally high rates of economic growth. By contrast, Philippine economic growth began to falter, especially from the late 1970s, and particularly during the country's deep economic and political crisis in the mid-1980s. The collapse of the two-decade Marcos rule in early 1986 was accompanied by the sharpest economic contraction in the country's economic history as an independent nation state. The economy was in free fall, with GDP declining by about 15 per cent in the years 1984'86 and poverty incidence rising sharply. Thereafter, a fragile political system was gradually constructed, punctuated by periodic political instability and extended debt negotiations. This was the country's lost decade, as most of East Asia boomed, fuelled by a newly dynamic China and the relocation of labour-intensive manufacturing from Northeast to Southeast Asia. At the turn of the century, Philippine per capita income (PCI) had not progressed beyond that achieved in 1980. Comparative surveys of Asian economic development have highlighted, and puzzled over, the country's divergent economic path. A leading contributor to the literature on growth empirics speculated that the country was “a democratic dud” (Pritchett 2003). Infrastructure is a driver of growth. It provides energy, water and other production inputs. It connects products with markets, and labour with jobs. Infrastructure enables access to education, healthcare, housing and other services that let communities thrive and be more resilient. Investments in infrastructure promote economic activities that generate employment, increase household incomes and reduce poverty. According to an estimate of the World Economic Forum (WEF), every dollar spent on a capital project (in utilities, energy, transport, waste management, flood prevention, telecommunications) generates a 5'25 per cent economic return. Clearly, the lack of infrastructure is a constraint to growth and poverty reduction (Llanto 2015). Ideally, infrastructure keeps pace with demand even as demand itself is catalysed by infrastructure in a virtuous spiral of growth. Not surprisingly, the biggest demand for infrastructure is in urban areas, where population and activities are concentrated. With scale and agglomeration economies, these areas are often associated with innovation and productivity, economic growth, employment generation and higher (than rural) family incomes. This is consistent with the Philippine experience, as the largest urban centre, Metro Manila, is the primary venue for poverty reduction in the country. It is useful, therefore, to view infrastructure in the context of the country's network of settlements, keeping in mind that rural areas are inextricable elements of this network (e.g., as agricultural productivity rises, surplus labour migrates to urban-based industries and services which, in turn, are fuelled by rising worker incomes as industrial productivity also rises). Cities are working as engines of economic growth and venues of poverty reduction, with infrastructure that provides quality services and affordable housing, and forms efficient and connected networks of sustainable communities. This chapter looks at infrastructure (including housing) in the Philippines as it relates to the vision from two analytical perspectives. The first is a summary of how the infrastructure sector has performed. It covers both the national and local (metro/region) dimensions. Performance indicators, benchmarks and targets are identified. The second is a complementary and broader analysis of infrastructure from the perspective of urbanization, or, broadly speaking, the settlements network. It looks at how population is distributed throughout the country and how this affects the location of infrastructure, as well as overall urban and regional development. Poor governance and weak public institutions can undermine even the most well-crafted policies to promote inclusive development. Corruption, poor public service delivery, misallocation of resources, political instability, uncoordinated government agencies and deeply embedded patron–client relationships are among the challenges of governance and institutions that slow down or defeat any socio-economic reform agenda. In particular, corruption is a sizable problem in the Philippines, affecting all sectors and levels of government. In this chapter we refer to governance as the manner in which public officials and institutions acquire and exercise the authority to facilitate collective action, craft public policy and provide public goods and services. On the other hand, institutions refers to the formal and informal rules that shape human interaction and their related enforcement mechanisms. Institutions therefore determine the possibilities for effective governance and collective action (see Figure 9.1). Both the government and market need institutions to function well. Otherwise, government and market failures are likely to litter the landscape instead of properly provided public goods and services. When government and markets work, then collective action outcomes — public goods and services — are more likely to succeed. It is widely acknowledged in the literature that poor governance and weak institutions are among the critical (Rodrik 2000, 2004, 2007; Nye 2011) constraints to investment and growth in the Philippines (see, for instance, ADB 2007; World Bank 2013; Aldaba 2014). Problems with governance, particularly corruption and political instability, weaken investor confidence and discourage the creation of much-needed jobs that can, in turn, potentially lift many Filipinos out of poverty. Weak institutions constrain the delivery of public goods and services that aim to enhance the supply and demand of labour, both of which are necessary to make economic growth more inclusive. As such, maintaining an environment stocked with adequate and well-functioning institutions is critical. Poverty amidst weak public goods and services could also debilitate efforts to continue building stronger institutions. As well elaborated in the political science and economic development literature, reformists often struggle against traditional economic and political relationships that are deeply engrained due to a long history of poverty, dependence and patron–client relationships. According to one set of official projections, if the Philippine economy were to grow at 7 per cent per annum, close to the rate achieved in recent years, then by 2040 the country's per capita income would be P316, 173 ($6,873) at constant 2000 prices — a sharp increase from the 2015 level of P74, 453 ($1,618). This is an optimistic forecast, given that annual per capita income growth over the past twenty-five years averaged only about 2 per cent. The impressive growth attained during the period 2011–16 was mainly driven by private and government consumption, which was, in turn, partly fuelled by overseas Filipinos’ remittances (BSP 2015). The sustainability of the recent growth remains tenuous. One constraint is the perennially high cost of power, as well as an inadequate power supply that cannot support the country's potential growth. The challenge lies in both the sourcing and timing of additional power supply to meet the growing demand and avert a recurrence of the power crisis that took place in the early 1990s, while also reducing the cost of power. Energy supply and cost are central to an improved investment climate that in turn generates a higher productivity growth. Philippine power costs are high by regional standards; within the Association of Southeast Asian Nations (ASEAN), it ranks second to Singapore. Thus, the country struggles to attract mobile capital, a reason why manufacturing growth has lagged in recent decades. We have elsewhere labelled the slower manufacturing growth compared to services as “development progeria” (Daway and Fabella 2015), where services forge ahead to developed-country levels in low-income countries. This translates into slow growth and slow poverty reduction. Republic Act (RA) 9136, otherwise known as the Electric Power Industry Reform Act (EPIRA) of 2001, has the well-intentioned objective of opening up access to, and fostering competition in, the retailing of electricity so as to lower the price for consumers. However, electricity prices in the Philippines remain among the highest in Southeast Asia. Figure 7.1 shows the trends in electricity tariffs for residential and industrial customers in selected Asian economies. In 2013, for example, the Philippines’ residential rate was $0.14/kWh, much higher than the rate in Singapore ($0.12/kWh), Thailand ($0.08/kWh), Indonesia ($0.04/kWh), and Malaysia ($0.06/kWh). While the Philippines’ industrial rate ($0.10/kWh) was a close second to the highest rate in Singapore ($0.11/kWh). No Longer the East Asian Exception? 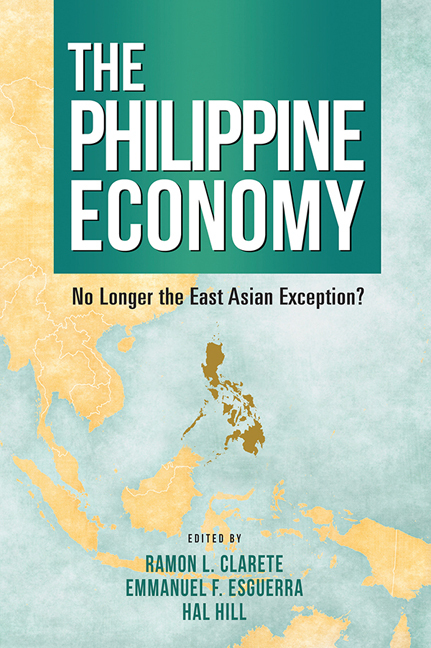 In this volume, a leading group of scholars pose the question, has the Philippine economy rejoined the dynamic East Asian mainstream and, if so, what set of policies and priorities are required to maintain the strong economic momentum of recent years? Successive chapters address issues related to growth and poverty, infrastructure and urbanization, education, health, the environment, energy, development finance, and governance and institutions. This volume has been written with a broad audience in mind. First and foremost it is for readers in, and interested in, this fascinating and important country with a population that now exceeds 100 million people. Second, it will appeal to those in the broader development community with an interest in the analytical and policy challenges that democratic, middle-income countries face as they struggle to lift their citizens out of poverty and to achieve broad-based and environmentally sustainable growth. The economic, political, strategic and cultural dynamism in Southeast Asia has gained added relevance in recent years with the spectacular rise of giant economies in East and South Asia. This has drawn greater attention to the region and to the enhanced role it now plays in international relations and global economics. The Trends in Southeast Asia series acts as a platform for serious analyses by selected authors who are experts in their fields. It is aimed at encouraging policymakers and scholars to contemplate the diversity and dynamism of this exciting region.